Event ID 4226 Patcher, EvID4226 fix, TCP/IP Patch, TCP Half Open Connection Limited Patcher. Raise the limited of half-open (incomplete outbound) TCP connection, Release the power of your network, download faster, and more task can be run at the same time. 1) Safe And Easy: Modifies Tcpip.sys in memory. The changes take effect immediately; do not need to restart the computer. 2) Wide Compatibility: It searches limited offset through signature, no longer focused on the MS upgrade and update. Support all version of Windows, Which with half-open limited. 3) Professional Chart: TCP-Z shows number of estabilished connection, half open connection, Create depth, download/upload speed in real-time. And software will show the number of warnings events in per-minute, which TCP half open connection overload. 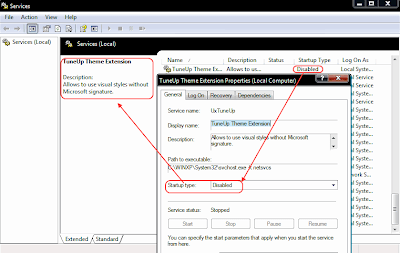 * GUI program, Remove the function of disable WFP, because Compatibility of this code is not so good. And because there is no disabled SFC, patch file will not to a 100% success, because Windows will automatically resume tcpip.sys. Run sfc /purgecache while apply the patch. 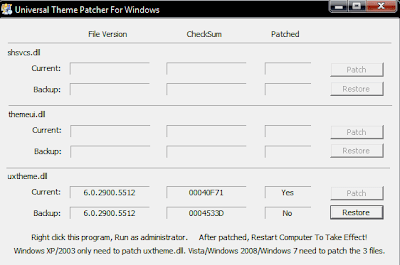 Remove Windows Setup CD from disk drive by running the patching. Geben Sie unter Start/Ausführen den Befehl sfc /purgecache ein wenn sie den patch ausführen bei WinXP. Nach Ausführen des Befehls wird der Ordner der System File Protection system32\dllcache geleert und Sie verfügen wieder über mehr Speicherplatz sowie die alte Sicherrungskopie im Catche Verzeichnis der tcpip.sys verhindert die gepatchte \system32\drivers\tcpip.sys zu überschreiben. Another way, use Memory patch method fixes. * Change digital signature of program files. + GUI program, modify UI, add a beautiful skin. + GUI program, display limited address in kernel memory, and file “Tcpip.sys”. For compatibility, only display low part in 64bit OS. * Fixed: unknown file limited value in Windows 7 Build 6.1.6936.0, and Windows 2003 5.2.3790.4331. * Fixed: file patch Fail in windows XP SP3, because unable disable WFP. # Drivers has no changes. 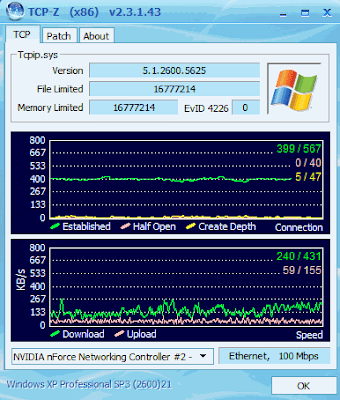 TCP-Z is the Best TCP/IP Limit patcher with an accurate Network Monitor. Shows how many open connections current and peak as well the upload/download speed. By upcoming Windows updates which can replace tcpip.sys with a newer version, please run the patcher again to enable more connections. By all file sharing applications a must have tool! uxtheme free your Windows supports 3rd party desktop msstyle themes. + show checksum of file. * Change method of reading version information. For Windows all 32 and 64 bit! Remove all Watermark on desktop. Such as "Evaluation Copy", "For testing purpose only", "Test Mode", "Safe Mode". Support: Windows Vista /Server 2008 /Windows 7, 64bit(x64) / 32bit(x86), All Service Pack & all language of Windows.